“Do you think Rupert and his men can have followed us here?” Vivian asked. Moreis stood and grabbed the dish beside Vivian to add to his own. “I’ll help ye,” he said. And, after giving Vivian and Quinn a speaking glance, he followed Gillis, leaving them alone. 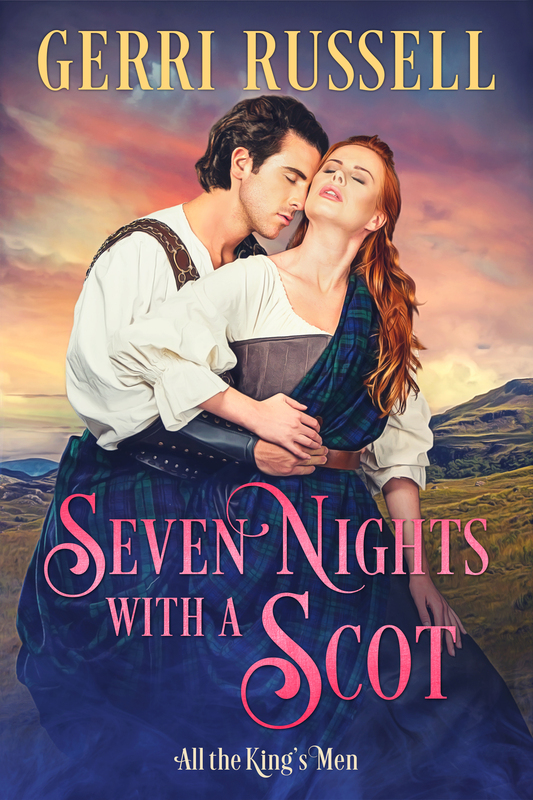 “And do you imagine you can be happy in East Lothian with my brother?” His stomach clenched. Sudden tension made his shoulders tight. Not for the first time did he wish things could be different for both of them. She lowered her gaze, shielding her response from him. “Perhaps we should call it a night.” He rose to his feet, backing away from the fire. What in Hades was wrong with him? She had wanted something more from him tonight and he was walking away. She is your brother’s bride. He reached out to grasp the trunk of a tree with one hand. His fingers dug at the bark until a ripple of pain went through him. He welcomed it as a distraction from another maddening ache. “Good night then.” Sorrow echoed in her tone. She was still for a moment before she stood and headed toward the loch. Quinn stared after her. Even though he shouldn’t, he wanted her. He wasn’t sure at what point he had become aware he wanted her. That first day when he’d helped her to her feet after Odin had nearly trampled her? Aye, he had wanted her then. His palm had tingled as it had touched the silky softness of her skin. Even then, he had tried to dismiss her effect upon him. He had to remember why he sought her and what his duty was. Yet never had his duty been this difficult to uphold. “Moreis and Gillis are there. I will send Moreis back and keep Gillis with me.” Vivian turned and left him, vanishing into the dark. In all his years of warring alongside his brother, Quinn had always managed to shape events the way he wished them to go through strategy and diligence. And yet, where Vivian was concerned nothing had proceeded as planned. They would spend four more days and nights together. They would no doubt be the four most torturous of his life.